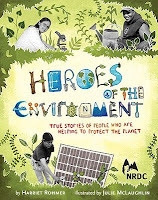 Heroes of the Environment: True Stories of People Who Are Helping to Protect Our Planet by Harriet Rohmer, illustrated by Julie McLaughlin. Chronicle Books, August 2009. Review copy provided by publisher. There's a general consensus that the environment is in need of some saving and in Heroes of the Environment we meet a dozen people who are doing just that. From providing space in cities to grow fresh vegetables to installing solar panels to bring electricity to rural Native American houses to inventing new ways to test water for harmful chemicals, these people are doing what it takes to make positive changes. One thing I really, really liked about Heroes of the Environment is the diversity of the people featured. Each chapter gives information about a different person and what he or she is doing to help the environment. The people featured are all Americans (with the exception of one Mexican and maybe a Canadian or two) and they are all from different areas of North America, different ages, and different ethnicities. Kids may find most compelling the stories of actual kids who are doing something to help the environment, but they will find inspiration in the works of others, too. This would be a great book to start a discussion on what your kids could be doing to help the environment in your community. Start a recycling program, clean up local beaches or parks, investigate threatened animal or plant species in your area. Some tips for getting involved are included at the end of the book. Happy Nonfiction Monday! Check out this week's roundup at All About Children's Books. This sounds like a great book - so inspirational for kids to read real life examples of people taking environmental action. So happy to find your blog through the Comment Challenge. Good to know about this one! I can think of many teachers who would find this useful. ohhh...I haven't seen this one yet. I must check it out. Thanks for the helpful review. This is why I love the comment challenge, all the great blogs you can discover aloing the way.